The amount of currency needed to buy a chicken at a market in Caracas last week before the Venezuelan currency was devalued. Many people have been left hungry. More than a million have tried to flee. It's little wonder Venezuelans have lost faith in their currency. "The central bank has been printing more and more money to try and pay the government's bills, making the money already in the economy increasingly worthless," says Jeremy Thomson-Cook, an economist at World First.The government's revenue from oil production has dropped sharply as production has fallen.Cash - freshly printed and drawn out of the ATM - quickly loses value.Venezuela, now in its fourth year of recession, has joined a sad list of other countries whose economies imploded as hyperinflation tore through them. "The situation in Venezuela is similar to that in Germany in 1923 or Zimbabwe in the late 2000s," said Alejandro Werner, the IMF's director of the western hemisphere department in a blog. What can Caracas learn from Zimbabwe? Zimbabwe devalued its currency, lopping several zeroes off its bills. Venezuela has done the same this week, removing five zeroes. However, the action failed to solve Zimbabwe's problems. 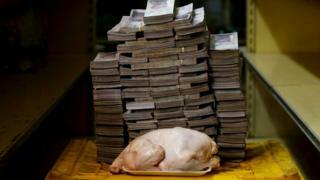 Economists say it will also fail to rescue the Venezuelan economy, particularly as it has tried the same trick before. "I'd say this has a low chance of working economically," says Mr Thomson-Cook.Zimbabwe ended up abandoning its currency and largely adopted the US dollar.This restored faith in the economy because it stripped the authorities in Harare of control over the currency and led to a rise in incomes. Venezuela is trying to adopt a version of this tactic - but it already has been rapidly discredited by economists.As well as removing five zeroes from its notes, Caracas has linked the currency's value to a little-understood cryptocurrency it has invented called the Petro.Petro is in turn related to the value of the country's dwindling oil production. "The plan is incoherent," said Carlos Larrazabal, president of the country's Fedecamaras business organisation.Digital "currencies" - which are not currencies in the traditional sense - have been highly volatile recently, with the best-known Bitcoin soaring and then plunging in value. "It's all worthless assets trading around each other," says Mr Thomson-Cook. Jeremy Stretch at CIBC World Markets agrees: "You need to look at the cause of the issue. There is this inherent instability because oil production levels have plummeted. "If businesses and economists are right, there'll be further economic pain and perhaps yet more attempts to change the currency.It's unlikely the Socialist government in Venezuela would happily follow Zimbabwe and adopt the dollar, the currency of its ideological foe, the US. "There is a lack of confidence in the government as a whole," says Mr Stretch.A change of government may be the only thing that restores faith in Venezuela's money.